110 registered members (Alan LJ, AnthonyPaulO, anotherscott, aphexdisklavier, anamnesis, atcsam, Barrasman, Animisha, BigIslandGuy, 20 invisible), 1,464 guests, and 3 spiders. Imagine you're home alone. It's late evening and you decide to practice piano a bit before sleep. You start your CA78, you put on your headphones (let's not annoy those who are sleeping already) and begin your practice. It's going well despite late hour. Suddenly in the middle of some passage you hear woman's voice. Not something random and distant but familiar voice in your head. You look around - there's no one to be seen. You are alone. You remember closing the door. What is happening? You focus on the voice - you recognize a singer that was popular during your your youth. She is kind of in the middle of recitation of some poem or maybe reading lines from a book. Finally you realize you have your headphones on. There's the source of the voice. But... headphones are connected to ... a piano. Before you actually focus on the meaning of the verses, voice breaks off in the middle of a sentence and is gone. Bluetooth is disabled in the phone! No app is running. No other device is around. What?? All this above happened to me last night. I had no idea what to think of that. Couldn't focus on playing after that, so I went to bed. Today I'm considering options. What could've caused that? My piano is in the middle of my apartment, against internal wall, far from external walls. There is only roof above me. Is it possible that someone living in the apartment interfered with my piano? Is the range and wall not an issue? Does CA78 accept any devices that try to connect? Are there bluetooth devices that scan for available bt audio output and connect to it automatically? You found an Easter egg. More likely radio pick. - A new manifestation of Synesthesia? One where the brain centre responsible for imagination is being triggered by the auditory stimulus? - Repeating trip? It's sometimes speculated that LCD trips can reappear many years after even a single usage. Mushrooms? If nothing else happens, maybe contact Ghostbusters? Last edited by CyberGene; 02/12/19 08:16 AM. We have have flat screen. In our old apartment, it was mounted on the wall in the bedroom. Sometimes in the morning, the TV got turned on by whatever. The screen remained black (no backlight, simply off) the red standby dot was still on and you heard some radio or tv audio coming from the speakers. There was clearly someone switchting through the channels. The audio itself sounded like a low quality signal. Til now we didn't found out how and why this occurs. At the new apartment, it didn't happend anymore. I've had this too. It turned out a neighbor who lives in a building very close to ours also had a LG TV and we have large windows each, so our infrared remotes could reach to each other's TV-s I am a hopeless sceptic in anything paranormal You should always seek the reasonable explanation in things. Last edited by Beowulf; 02/12/19 08:39 AM. So OP...who you gonna call? Aha! Thanks arc7urus! That was my suspicion. I believe you actually did your neighbors a favor. However I can think of some potential of silly jokes/trolling towards practicing pianist. With the next software update they'll be able to to even more ... like adjust your thermostat and unlock your doors! Hooray for the world of wireless techno-blunder! I had some neighbors connecting to the BT Audio on my CA98. 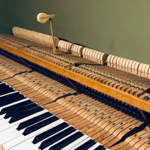 Welcome to the glorious world of the internet of things and smart connected devices... this is just a digital piano, right? Why even bother including the most basic security features?